Have you ever surprised your kids with a night of jousting? We did and the evening was filled with fun, excitement and of course smiles from ear to ear. 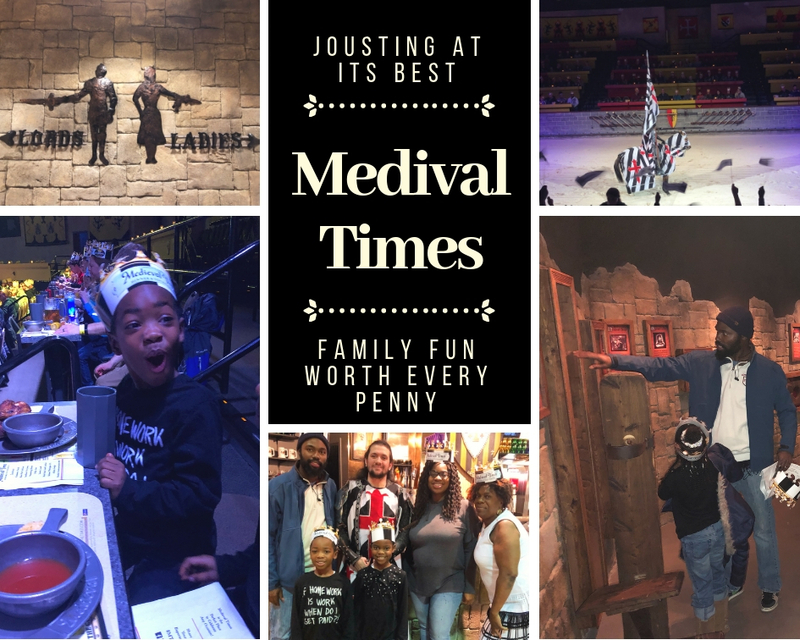 We chose just the right time to visit Medieval Times in Arundel Mills with the entire family to see the new show. For the first time in Medieval Times’ 35-year history, a Queen has taken the throne. Her Majesty Dona Maria Isabella presides over a tournament of knights who gather in celebration to test their skill against one another in a series of games, jousting, and combat. Let me tell you, we were all in for a treat! And then it happened, the doors opened up and their eyes seemed to be bigger than the moon. We were rooting for the Black and White Knight so we waited patiently to be seated. “What are we going to see?” they kept asking, with anticipation almost through the roof. We were greeted with a metal plate, metal bowl, a beer cup and no silverware. It was just the perfect arrangement for spectators during the Medieval Times and we were all in. Our waiter and all the others around us were very attentive to the guests and made sure we had everything we needed. Once the show started, the cheering began. Since we’re winners, we just knew that the Black and White Knight would be the best on the floor. There were about 4-5 games played and combat like we see in the movies. At one point, my daughter thought that one of the knights was going to be killed. After I assured her that it was just acting she yelled, “get him!” There was even one point in the beginning of the show where a falcon (I believe) was released into the audience. It flew around the arena about 3 or 4 times before landing back on the arms of the trainer. It was amazing and scary all at the same time. The horses performed in their own show with tricks, cute prancing and more. As the show went on, were served our food. On the menu was tomato soup, garlic bread, a huge piece of chicken, corn, a potato wedge and lemon pound cake. My son could not stop talking about the food, he absolutely loved it! I think it was his favorite part. As we came to the end of the show, we cheered on the Black and White Knight as he defeated his opponent, named Champion and was honored by the Queen. Yeah, we knew it, we always stick with the winning team! After the show we went into the dungeon to take a look at the tools and weapons of torture. I would not recommend that kids actually read about the torture weapons if they are less than 11 or 12 because it can be a bit much to take in. The area is small in size but full of information you may or may not want your kids to know about. Experience the new show for yourself at Medieval Times locations near you. For a limited time, tickets are only $37 using code USF37. Take your family our for an experience to remember, you won’t regret it! We thank Medieval Times for hosting us during our visit. All thoughts and opinions are our own.